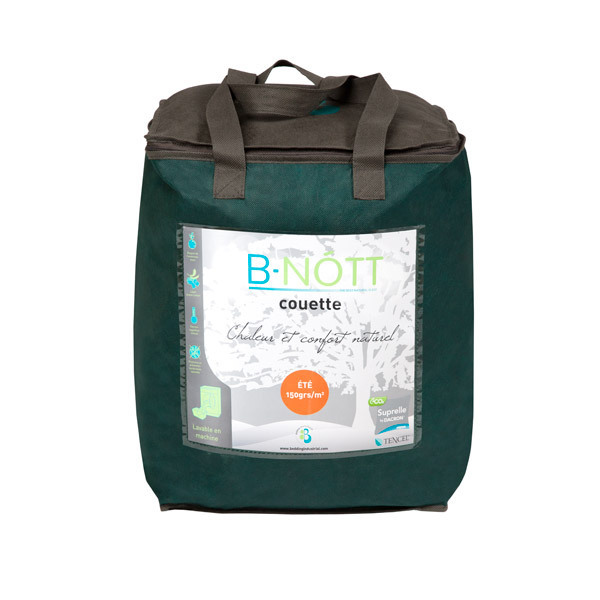 The B-Nott duvet is made from natural fibres, it is light and offers maximum comfort as well as being practical. Machine washable. Duvet filling, 150g/m², Dimensions, 200 x 200 cm. - B- Nott obtained European Eco- label certification. - Environmental Protection: Member of the ECOPROFIT ® program in Germany since 2007. Reduction in overall energy consumption (water, electricity) and CO2 emissions. B-Nott is an innovative brand that specializes in the manufacturing of technical fabrics for bedding. The B-Nott brand manufactures 100% of its products within European and uses Tencel® fabrics, that are 100% natural fibres. Tencel® is the trademark name for lyocell. This fibre is made ​​from eucalyptus pulp. It offers unparalleled softness, absorbs moisture and also has isothermal qualities: Tencel® regulates the temperature of the tissue against the skin. Giving maximum comfort and quality to its customers. B-Nott uses materials exclusively sourced from sustainably managed forest plantations. The innovation is that the non-toxic solvents used dare also recycled. B-Nott has even received the Ecolabel European Union for some of its materials and processes.